When a celebrated ACTOR IS FOUND MURDERED IN HIS DRESSING ROOM, all signs point to Drew's old flame. But behind the curtains nothing is what it seems and this quickly becomes his MOST puzzling case YET. Just as Drew Farthering thinks his life has calmed down some, Fleur Landis, a former girlfriend, reappears, in dire need of his help. 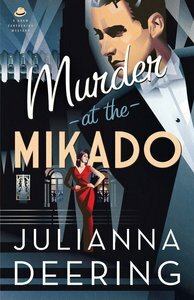 She's married now, no longer an actress--but the lead actor in her former troupe's production of The Mikado has been murdered, and Fleur is the police's number one suspect. Drew would rather focus on his fiancée, Madeline Parker, and their upcoming wedding, but he can't leave Fleur and her family in the lurch--even if she did break his heart once. As Drew, Nick, and Madeline begin investigating, they discover more going on behind the scenes of the theater troupe than could ever have been imagined. It seems nearly everyone had a motive, and alibis are few and far between. Both the murder case and the presence of the beautiful, exotic Fleur put a heavy strain on Drew and Madeline's relationship. Will their still-young romance survive the pressure? About "Murder At the Mikado (#03 in Drew Farthering Mystery Series)"